You are currently browsing the tag archive for the ‘Admired rather than loved’ tag. At its simplest Tony & Susan by the late American author Austin Wright is a book about the experience of reading. First published in 1993, it’s been out of print for a while (and think it might still be in the US), possibly because it isn’t a book that can be easily categorised, and is of interest for that reason alone. I was going to say that it “tells the story of” but it doesn’t really; we are with Susan as she reads the novel written and sent to her by her ex-husband Edward, while her current husband Adrian is away at a conference. 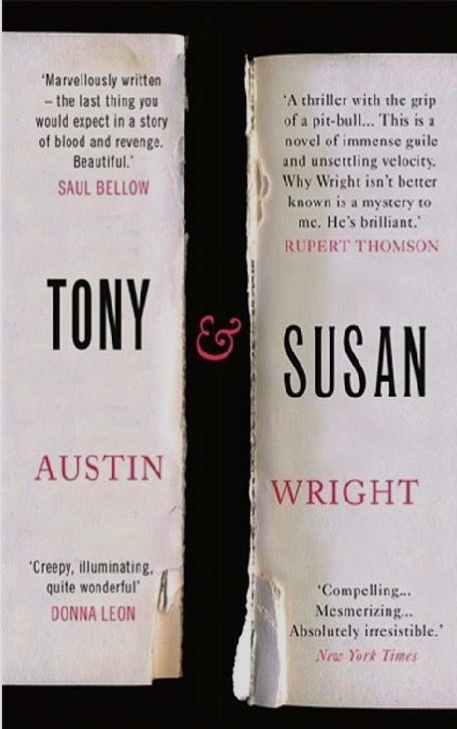 We learn about Susan’s relationships as she ponders her past in between reading the novel, in which Tony is the central character. I bought this as an ebook this time last year but can’t remember where I heard about it or who may have recommended it to me. It reappeared on my radar following a mention on Twitter by James Smythe (an author I really rate and have reviewed here more than once) as a book that really unsettled him, and as I had just been through a series of serial killer based police procedurals I was looking for something different and this was it. This is a novel that has clearly resonated with a number of distinguished people who have loved it and praised it to the skies. You are probably expecting a “but” now, however I’m not going to disagree with them necessarily. It is an unsettling book in that I’m not sure exactly what it is, if I can put it that way. Much depends I think on your reaction to the book within the book, the story of Tony and the dreadful events that befall him (the internal novel is called Nocturnal Animals) and I suspect that’s where my problem lies because I really didn’t get on with NA at all; I’m not sure whether it was meant to be a thriller or a revenge tragedy but I got so cross with Tony that I didn’t really care what happened. I was much more invested in Susan, her fears and memories and hopes all triggered by the experience of reading NA. I liked her, I think I understood her and I was always impatient to get back to what she was thinking. I don’t know if that’s a gender thing (I’d like to think it’s not as simple as that given how much blood and guts revenge stuff I actually read) and in many ways Tony and Susan are equally passive, but I found her passivity easier to swallow, though of course I’ve never been through anything remotely as awful as Tony so have no idea about how I might act, and am therefore probably being totally unfair. I just wanted to shake him. A lot. So a book that I admired rather than enjoyed, though Susan’s voice has stuck with me longer than I expected.